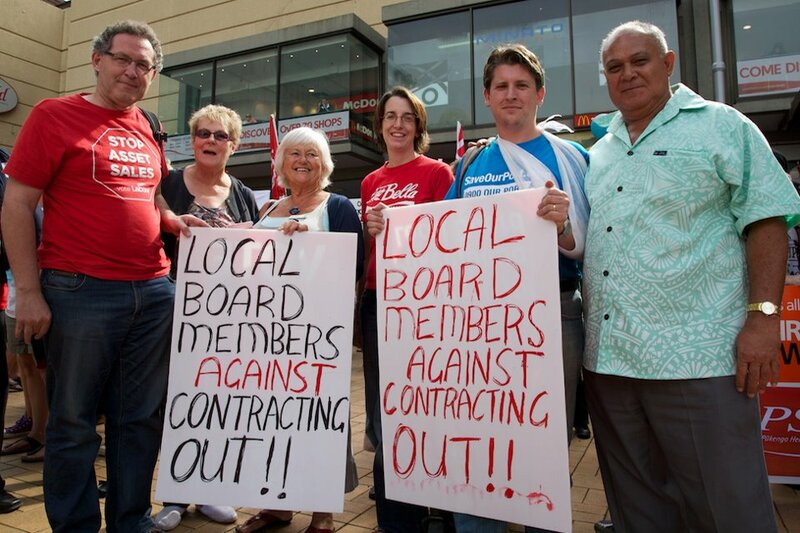 On Saturday a number of Roskill Community Voice members and supporters attended the rally to Save Our Port, to show our opposition to the contracting out of port workers' jobs, and support the watersides and their families as they fight for decent working conditions. Greg Presland & Denise Yates (Waitakere Ranges), Tricia Reade (Waitemata), Julie Fairey & Michael Wood (Puketapapa, Roskill Community Voice), Peter Skelton (Mangere-Otahuhu). Other Local Board members spotted on Saturday included Leila Boyle, Josephine Bartley, (Maungakiekie-Tamaki), Richard Hills, Viv Keohane, Grant Gillon (Kaipatiki), Shale Chambers, Christopher Dempsey, Tricia Reade (Waitemata), Catherine Farmer (Whau), Peter Haynes (Albert-Eden) Denise Yates, Greg Presland (Waitakere Ranges), Lydia Sosene, Peter Skelton (Mangere-Otahuhu). A number of Governing Body members were also in attendance to show their support, including Sandra Coney, Mike Lee and Roskill Community Voice-endorsed Cathy Casey (from Albert-Eden-Roskill ward, which includes Puketapapa). A few more pictures to come over the next few days too.